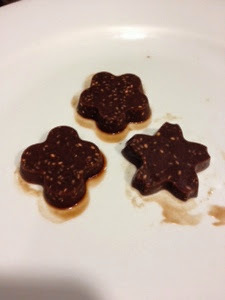 This is not a ground breaking take on chocolates and I got the idea from a blog post about the various uses for chia seeds. They are really good! It gives it a crunch bar texture but it's healthy. I used my chocolate recipe but I ran out of cacao so it is more oil than solid (that's why they are melting in the picture) but they still turned out really well.